Our HIPAA consultants are experts who focus on information security audits. We deliver a holistic risk mitigation roadmap within our software portal so you can accomplish ongoing efficient risk management. Millions of dollars. That could be the price of a penalty for a HIPAA breach. In today’s financial environment, no healthcare organization can afford a steep penalty – and that doesn’t include the harm to reputation, potential loss of revenue and cost to rapidly upgrade and secure systems. HIPAA consultants with ComplyAssistant can help prepare and protect you against potential breaches. 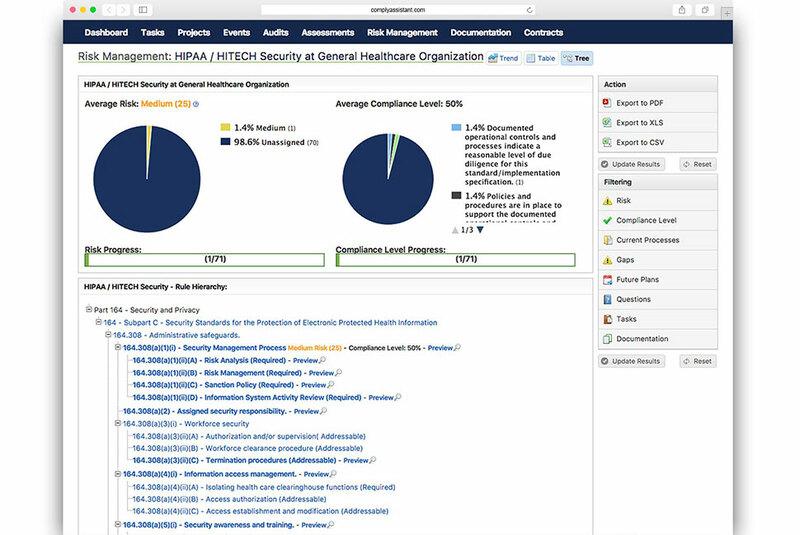 All of our healthcare compliance consulting engagements are designed to be comprehensive and directive so you are armed with an analysis and action plan to improve your HIPAA compliance protocols. Where do you even begin with a HIPAA consulting engagement? If you choose to partner with ComplyAssistant, our expert HIPAA consultants will sit down with you one-on-one. We’ll start by documenting all the places where protected healthcare information (PHI) can exist in your organization. For each of those areas, we’ll work with you to review your current controls, determine where gaps may exist and decide if risk mitigation is required. The results – and subsequent action plan that we’ll provide – are stored in ComplyAssistant’s cloud-based healthcare compliance software. You can easily access your action plan to assign tasks for ongoing management and governance. We want to work for you! Our goal is to help prepare and protect you by assessing and maintaining your HIPAA compliance standards. Our HIPAA consultants, in tandem with our healthcare compliance software, are a unique and holistic solution for any organization. Our consultants document each component for risk level, compliance level, current processes and controls, gaps and future plans. Our HIPAA consultants bring value to customers across the country. We provide support for a range of information security frameworks. In addition to our HIPAA consultants, we can assist with information security frameworks like HITRUST, PCI and NIST. Each framework has a different structure and may not be applicable to every facility. We can help you decide which framework is right for your organization, and guide you through adoption and ongoing maintenance. Looking for HIPAA compliance resources and templates? Check out our free tools.